All acoustic foam panels supplied by NetWell Noise Control are class A fire rated and approved for use in any public or private setting. We offer a variety of soundproof foam panel options, including three different colors of Melamine Foam. A favorite among DYI enthusiast, our acoustic foam panels are easy to install with silicone adhesive. Our soundproof foam panels are used in acoustic applications such as recording studios, music rooms, vocal booths, broadcast studios, as well as, in soundproof foam applications in commercial and industrial settings. The key to getting your desired sound is in choosing the correct acoustic foam panel thickness and the right number of soundproof panels for your project. Thicker foam acoustic panels will generate stronger sound absorption values at the low frequency end of the sound spectrum. The thicker your soundproof foam panels (for example our Anechoic Foam Panels, MelaMax), the better they will perform for low bass noise stemming from musical instruments or industrial machinery. If you are wanting to control mid to high range frequencies, such as human voice, you should choose one of our thinner soundproof foam panels. Coverage amounts depend on the size and scope of your sound management project. Check with our help desk to insure proper treatment of your space. By explaining your acoustic application, we can properly guide you in the quantity of acoustic foam panels needed. To insure proper coverage and panel thickness for your soundproofing project, we recommend consulting with our help desk. 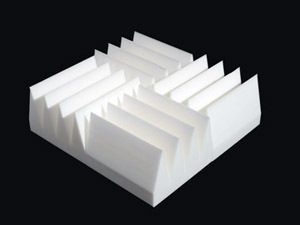 Because soundproof foam and foam acoustic panels are chemically based, they will decompose over time and become brittle. Be sure to ask about alternative acoustic products that best meet the environmental needs of your project. We offer several alternatives to acoustic foam. We can help you find the perfect fit based on your specific soundproofing and noise control needs. For additional help in selecting the right product, call our help desk at 1-800-638-9355. 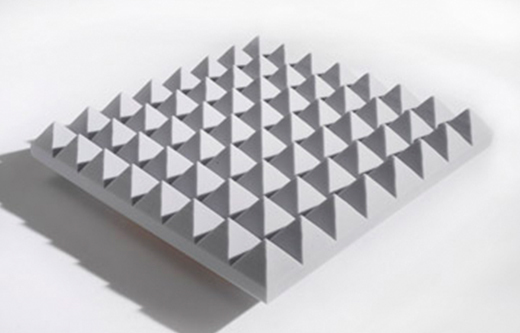 Pyramid foam acoustic panels absorb echoes and create premium sound quality. They are cut into 2’x2′ squares that measure 2″, 3″ or 4″ thick thickness. Ideal for combating sound wave reflections in a variety of commercial or industrial applications. Note that as you place the Pyramid soundproof foam panels flush to your surface, that the alignment from panel to panel will generate a continuous look to your treatment, stretching seamlessly across the expanse of your surface. If your acoustic treatment is targeting human voice only, opt for the 2″ thickness. But if your acoustic treatment is targeting control over bass reverberations stemming from musical instruments or industrial machinery, target the 3″ or 4″ thick acoustic Pyramid soundproof foam panels. Call our help desk as needed. 1-800-638-9355. The VCut sculpt from our melamine foam will combine to produce the decorative parquet look to your perimeter wall surface. These VCut foam wedges produce a striking presentation to your room using sound dampening foam to control excessive levels of background noise. Unlike the Pyramids which generate a continuous and seamless look to the surface being treated, the VCuts are designed to generate the unique parquet look. Both products perform to the same values back, they simply represent two different visual presentations of the same acoustic foam for your project. Again, thicker VCut soundproof foam panels should be targeted if your sound sources are low bass frequencies such as drums, bass guitars, or industrial machines. Thinner foam acoustic panels will suffice if the noise source is mid to high range such as you will find in human voice. Call our help desk to help diagnose the correct panel thickness and count for your upcoming acoustic project. 1-800-638-9355. 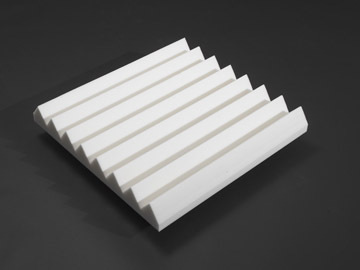 MelaMax are ultra thick blocks of melamine acoustic foam to tackle the most aggressive sound sources and are also the product of choice for all anechoic chambers and dynamometer rooms. Use these MelaMax anechoic foam panels only for your most aggressive noise sources or for sound test measuring. These cubes of thick acoustic foam measure 12″x 12″ square, and are typically shipped in 6″ or 8″ thickness. But they can also be cut up to 36″ in depth using the same melamine foam. FireFlex melamine acoustic foam panels are ideal in a variety of settings from recording studios to factories. Soundproof panels are available in three color and thickness options, allowing you to choose the base frequency energy level you need. For help in calculating coverages amounts for your acoustic foam panels, use this form to submit your room size and we will quote your project back. If you have questions, call our help desk at 1-800-638-9355.